Citrus leafminer is a very small, light-colored moth, less than 1/4 inch long. It has silvery and white iridescent forewings with brown and white markings and a distinct black spot on each wing tip. The hind wings and body are white, with long fringe scales extending from the hindwing margins. 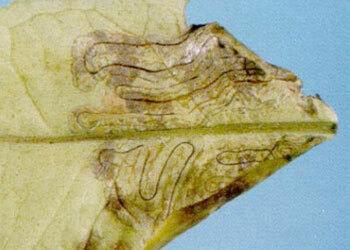 Citrus leafminer larvae feed by creating shallow tunnels, or mines, in young leaves of citrus trees. The larval stage is found only inside mines of citrus leaves and other closely related plants. As it feeds and develops, the larva leaves a frass (feces) trail, observed as a thin dark line, inside the meandering serpentine mine just under the surface of the leaf.